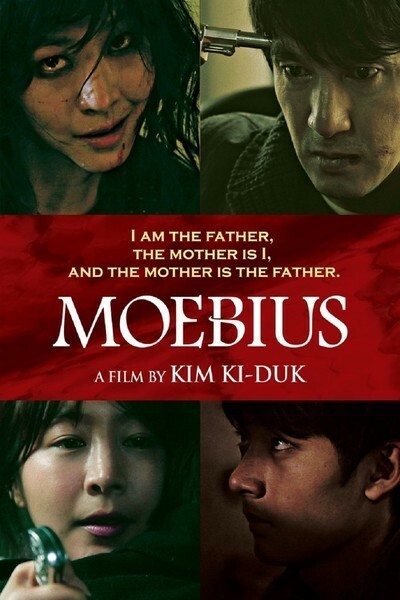 Kim Ki-Duk’s “Moebius,” the follow-up to his Golden Lion-winning “Pieta,” takes many of the bizarre, incestuous beats of that drama and twists, contorts and morphs them into black comedy. Although many who read even the comparatively tame plot description that comes shortly in this review will probably doubt the comedic undertones of the latest from the controversial Korean director. Trust me. Kim uses provocation through extreme imagery to satirical ends. He wants you to squirm, be uncomfortable, and even laugh at the insanity of what’s happening on the screen. And, again, trust me, the word insanity is not an exaggeration in this case. “Moebius” is a three-actor, four-character piece that plays like Greek tragedy filtered through the lens of extreme filmmakers like Takashi Miike. As soon as one thinks that Kim has pushed the envelope narratively and visually, he has something else disturbing up his bloody sleeve. The three entirely committed, fearless performers put through the physical and emotional motions by Kim carry a film that is the definition of “not for everyone” but “Moebius” works on its terms. Its twisted, Oedipal, sadomasochistic, castrated terms. A man (Jae-hyeon Jo) is having an affair. A mother (Eun-woo Lee, who also plays the mistress) knows about the affair and she’s cracking in every possible way. She confronts her husband and attempts to castrate him. She fails. So she castrates her son (Young-ju Seo) and flees the home. The father feels such grief over his son’s castration for his own sins that he becomes obsessed with trying to find ways for the young man to achieve sexual release. His journey into the kind of Google searches that the authorities sometimes track results in the discovery that some people get off by rubbing stones on their skin until they bleed while others who have been castrated have found release by having knives shoved in their back and twisted around. Did I mention that dad's mistress becomes the object of sexual obsession of the son? Careful readers will note that the mistress and mother being played by the same woman is not thematically coincidental. And then dear old crazy mom comes home and things get REALLY weird. Did I mention all of this is conveyed without a single line of dialogue? Kim’s film is not a silent one a la “The Artist” but a film in which the characters simply never speak. Oh, they make a variety of other noises, most of them guttural. It almost feels like Kim was trying to see how much human suffering a filmmaker could convey without the crutch of dialogue to do so. And so we hear groans, moans, cries, and every other sound one can imagine that doesn’t include actual pronunciation. The decision to craft “Moebius” as a dialogue-free piece has a dual impact. First, it heightens viewer involvement as we have to lean forward, concentrate heavily on the blocking and staging to follow a story that has no subtitles or other traditional sign markers. Second, it creates an exaggerated world like a theatrical piece that chooses movement or interpretative dance, for example, to convey its themes instead of narrative. And that element adds to the black comedy aspect of “Moebius”—this is inherently ridiculous but it’s made more so by no one commenting in any way through dialogue on that ridiculousness. To say the performers in “Moebius” are fearless, especially Eun-woo Lee, would be understating it significantly. Kim asks an amazing physical and emotional freedom of his actors and they all deliver. We can sit back and appreciate Kim’s daring work as a commentary on the way modern society deals with sexuality, infidelity and insanity but one shouldn’t ignore the very practical nature of what’s happening onscreen in some of the darker moments you’ll see in a cinema this year. Kim, like a lot of great shock artists, creates a work so intentionally button-pushing and maniacally over-the-top that it demands your attention. He may be one of the international cinema scene's most divisive filmmakers but no one can argue that he’s going through the motions or failing to explore the function of his demented form.